A Suprise Breakfast for Mom!!!! "Flowers" made from selection of sliced strawberries, sliced almonds, mandarin orange segments, sliced kiwi fruit, pineapple chunks, and maraschino cherry halves. 1. Stir together flour, sugar, cocoa, baking powder and baking soda in large bowl. Combine buttermilk, eggs and oil in separate bowl; add all at once to flour mixture. Stir just until moistened. 2. Pour about 1 tablespoon batter onto preheated, lightly greased griddle or non-stick skillet. Cook over medium heat until bubbly surface on top; turn and cook just until set. 3. 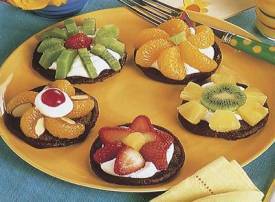 Serve each pancake topped with heaping teaspoonful whipped topping, topped with selection of fruits as flowers. Makes about 40 small pancakes. Leftover pancakes may be tightly wrapped and frozen for later use. Place 5 pancakes on microwave-safe plate in circular pattern; cover with wax paper. Microwave at HIGH for 1 minute or until warm.